My vegetarian and vegan friends are all obsessed with beans. And lentils, and soy. Is there something about not eating meat that makes legumes irresistibly delicious? Some sort of secret vegetarian conspiracy to hoard all the beans? Actually, it all comes down to protein. Many of the most important parts of your body – muscle fibers, the enzymes that break food down, the channels and chaperones that move stuff around your body – are proteins. If you’re a vegan or a fitness enthusiast (or both! ), you have probably noticed that plants are generally not a great source of protein. But some plants have more protein than others. Specifically, the legumes – a large group of related plants including beans, chickpeas, lentils, soybeans, peas, and others – are chock full of the stuff. Why? It turns out, legumes have an ingenious trick up their sleeves (pods?) 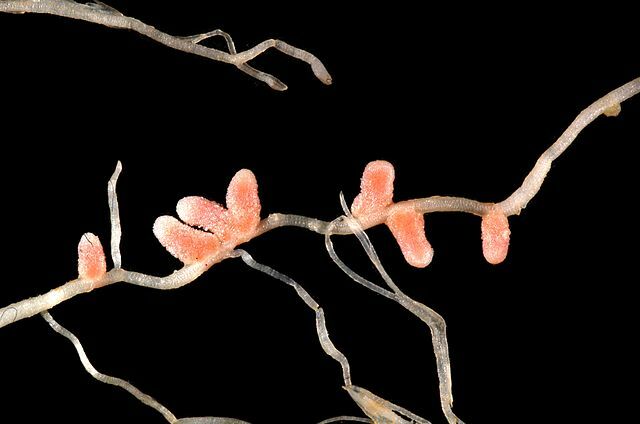 This group of plants welcomes a certain kind of soil bacteria into their roots, and goes to great lengths to make sure they’re comfortable. Legumes house these bacteria in little organs on their roots called “nodules” (pictured above), feed them sugars and water, and even regulate the amount of oxygen available to their bacterial guests. What do these gracious hosts get in return? They get the nitrogen that they need to build protein. All plants face a problem. We learn in high school that plants make their own food, and that’s mostly true. They can produce their own energy (in the form of sugars, starches and oils) from water and carbon dioxide through the miracle of photosynthesis. But as any good gardener knows, water, air and sunshine are not enough for a plant to be healthy. They need the nutrients present in fertilizer or rich soil. The three most important of these are the three numbers you see on the top of a bag of fertilizer – Nitrogen, Phosphorus and Potassium (N, P and K). Bacteria like this grow naturally in soil. In fact, that pleasant smell that you get after rain or when you overturn soil (called “petrichor”) comes from diazotrophic bacteria called “Actinomycetes“ that live free in the soil. But legumes have an ability to concentrate and feed diazotrophic microbes (of the group Rhizobia), allowing them to produce a lot more usable nitrogen than they could living free in the soil. Generic amino acid – notice that purple “N” for Nitrogen! This fixed nitrogen is a key ingredient in amino acids, which are in turn the building blocks of proteins. Legumes’ partnerships with diazotrophic bacteria is directly responsible for the high protein content of beans, chickpeas, soy and lentils. This symbiosis helped legumes become one of the most successful plant families in the world, boasting the third most species (behind orchids and grasses), distributed widely across the globe. Many of these species play dominant ecological roles in their habitats, providing nitrogen for other plants and protein for animals. In turn, human domestication of legumes has allowed us to meet the protein needs of large populations without taking up vast tracts of land to raise animals. Furthermore, legumes and cereals (like wheat and rice) are exactly complementary in the amino acids that they lack and have in surplus. Eating grains and legumes together results in complete dietary protein – enough of all amino acids that humans need. The importance of this dietary trick to agriculture is underscored by the independent domestication of legumes and grasses in agricultural societies across the world. Without realizing the chemistry behind their actions, ancient farmers converged on similar complements of crops to meet their dietary needs. Lentils and chickpeas were complemented by barley and wheat in the Fertile Crescent, beans and maize in the Americas, soy and rice in East Asia, black-eyed peas and sorghum in Africa. Even today, with factory farms pumping out massive amounts of animal meat and intensive overfishing of the oceans, legumes still account for about a third of global human dietary protein. And the agricultural importance of legumes does not stop there. These plants replenish the soil with enough nitrogen for other plants, and are a critical part of any crop rotation scheme. 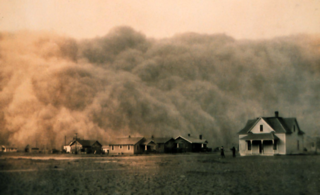 Soybeans and alfalfa helped restore the fertility of the American Great Plains after the disastrous “Dust Bowl” of the 1930’s. In the approximately 60 million years since legumes first formed their partnership with diazotrophic bacteria, they have diversified and conquered the world, becoming one of the most important groups of plants. Along the way, they have enriched soils, changed the way nutrients cycle worldwide, and allowed humans to create nutritious agricultural systems upon which we could base large societies. It is not an exaggeration to say that the nondescript bacterial bumps on the roots of beans have transformed the world. So on this Thanksgiving weekend, as you tuck into your aunt’s green bean casserole, take a moment to give thanks to the lowly bacteria, the humble bean, and the world their spectacular symbiosis has wrought.